Students juggle with studies, homework and leisure. Some kids may make excuses to avoid their school work. One of the main reasons behind this is that school work sometimes doesn’t seem interesting to kids. You can make your kid’s school work more interesting with some affordable and attractive school supplies. Proper school supplies can fetch higher grades for your kid because these items allow him to pick and use the right thing at the right time without wasting time. Here are some ideas that can help you cheer your children for school work. These ideas can also help you organize all the school supplies. Elementary school kids require things like crayons, markers and pencils whereas college students need things like pens, pencils etc. Therefore, you must create a study spot for your kid. You can use some chairs and large table for this. This helps you keep the school supplies at one place. You can use the table’s drawers to store some pencils, pens and erasers. You can also use different jars to store these things if your table doesn’t have drawers. Creating a study room or spot helps your kid perform and concentrate properly. 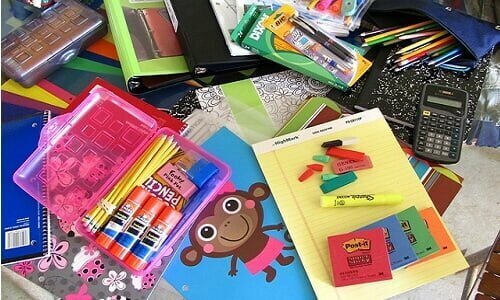 Every elementary school and college student needs some school supplies. Elementary as well as college students can pick some nice pencil boxes according to their age. For instance frosted plastic pencil boxes from PrintGlobe will be ideal for college students. These pencil boxes are simple and sophisticated. Available in various attractive colors, they allow you to store all your stationary items including pens, pencils, rulers, protractors etc. You can take this compact pencil box to your college every single day. You can pick a rubbermaid spacemaker 12 compartment art supply station from Pens N More if you want a more spacious box that could store your calculator. This spacemaker pencil box is suitable for elementary as well as college students. It provides you accessible storage for your scissors, crayons, markers, glue and more. Featuring eight large and divided compartments, this is a spacious spacemaker pencil box that comes with a removable four-compartment center bucket.